The other day, I introduced kaiten-zushi but that is not the only moving food in Japan! 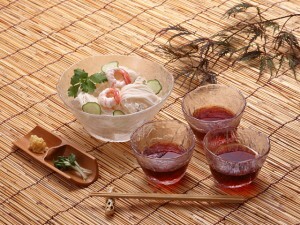 In summer, we occasionally do nagashi-somen, which means flowing noodle. It’s like a water slider for cold noodle. 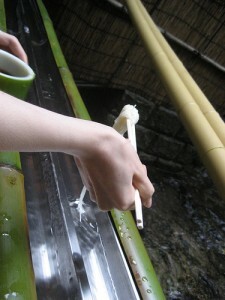 We make bamboo slider first, and then let somen-noodle let flow on the slider with ice cold water while others pluck the noodle with their chopsticks. Somen is thin cold noodle made of wheat flour, eaten with cold men-tsuyu (sauce dip). Green onion, ginger and sesame are added too. Because it’s cold and refreshing food, it’s likely to be eaten in summer. It is usually served in a large glass bowl. 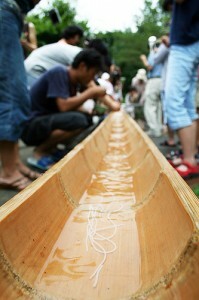 Nagashi-somen is held as outside activity for camping or summer festivals; although, there are nagashi-somen restaurants and also table sized nagashi-somen machines. чтобы добавлять свои статьи, обязательно ли регистрироватся? Hello, Thank you for your comment! Feel free to quote my posts 😉 But please note my Blog name (Japan Style) and URL link in it.